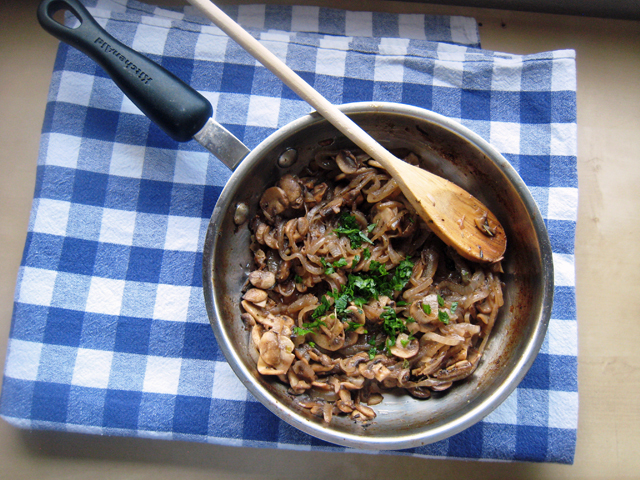 Mushrooms and onions sauteed in a bit of oil and balsamic vinegar add punch to pizzas, grilled meats, and pastas. Mushrooms are one of my favorite foods on earth. Definitely in my top ten. Pizza? Mushrooms, please. Steak? Mushrooms, please. Pasta? Mushrooms, please. I have at least one child who shares my affinity for mushrooms. That justifies my indulgence. And it’s so fun to experiment. 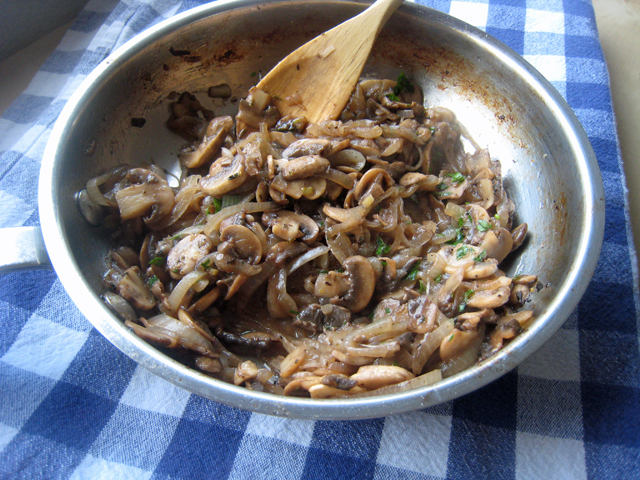 Like with this panful of sauteed mushrooms and onions. These are simple, flavorful, and hearty — and add great flavor to pizza, steak, and yes, pasta. You can even tuck them inside an omelet or on a sandwich. We enjoyed chicken, brie, and this topping on Italian bread. Yum-O! In a large skillet over medium high heat, heat the olive oil. Add the onions and saute for 3 minutes. Add the mushrooms and continue to cook on high for 5 minutes, more stirring occasionally. Onions should become clear and the mushrooms should give up their liquid and start to brown lightly. Season to taste with salt and pepper. Add the balsamic vinegar and and herbs and stir, scraping up any browned bits. Cook 5 minutes more on medium heat until the liquid has evaporated. Use balsamic vinegar for a little zest. One of the things that truly adds a depth of flavor to this recipe is the balsamic vinegar. It’s a great thing to jazz up sauces, but it works well in sauteed vegetables as well. Good and cheap – just how I like it. Love the recipe and love the blog!